The app syncs with your other PDFPen apps using iCloud, so you can scan with your iPhone, read and annotate on your iPad and, uh, do something else on your Mac. And like Scanner Pro, it can also send your scans off to Evernote and Dropbox. All the usual tools are here: edge-detection for pages, cropping and image-adjustment tools, plus OCR in 16 languages. This means that you can go into a restaurant, scan and OCR the menu and then search on any of its contents in the future. 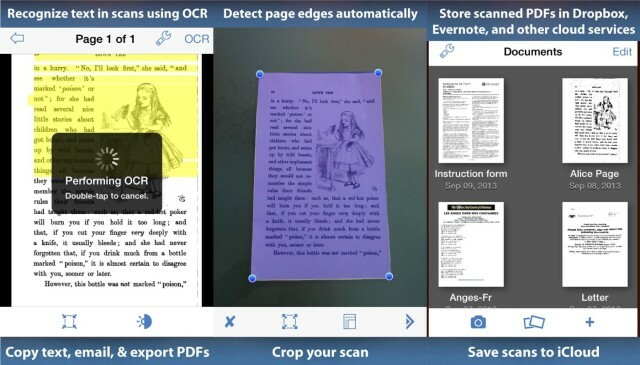 Yes, there are a ton of app out there for scanning, and a few which offer good OCR. But PDFPen Scan+ does both, and also integrates with your existing PDFPen iCloud library. It’s just $5, and I have bought it already.